NYC New York Color Cosmetics has launched a range of Big Bold Plumping Lipgloss for Spring 2013. These jumbo glosses are on pair with Hard Candy Glossaholic housing a whooping 0.39 oz of gloss for a mere $3.99 each! Available in twelve shades the price and color selection definitely gives Hard Candy a run for the money. This a lot of gloss for the price so when I saw them at CVS recently I quickly grabbed up a few to try knowing that I’d return for all the shades if I loved them. You might be familiar with massive glosses like these as a few brands have put them out over the last two years like MAC, Hard Candy, and Flirt just to name a few. Each gloss has a massive sponge applicator about three times the size of a normal one (see comparisons below). This applicator may seem clumsy but actually works really well to get gloss onto lips in a single stroke. These particularly glosses have a nice opaque finish…well…perhaps not fully opaque but they have a good deal of tint behind them for a gloss although color isn’t exactly true to tube finish. The two shades I tried (I got a clear one as well) didn’t quite have the vibrancy on my lips that they did in the tube, they appeared a little duller, but none the less they didn’t lack pigment that much is true. I’m actually not a fan of the gloss on a whole and can only really rave the pigment. The gloss has a gooey texture which comes out of the tube in thicker ropes. Be careful when removing the applicator as ropes of gloss come along for the ride….do so slowly to avoid this. I think what disappointed me most about the gloss is it didn’t apply as thickly as the formula might imply at first. I expected super shiny, thick gloss but it actually thins out on my lips and has a drier texture without a ton of shine or glossiness. Darn! I was so hoping for more of a mirror-like shine. I’m not terribly keen on the taste either…I haven’t quite figured out what sort of flavor they have…it’s sorta modeling clay like?! with vanilla? They wear quite comfortably on my lips and lack a tacky, sticky feel. They give lips a nice plush look but not necessarily the 50% pouting effect that NYC promises. Although a plumping gloss they don’t sting in the least, I believe the formula is dependent on the thickness to create the pouting effect. 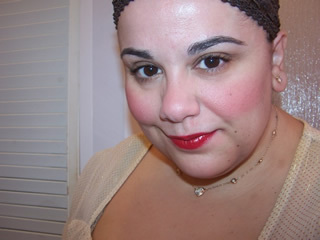 The gloss does like to migrate a little around my lip line so a little lipliner is in order. Overall, I wasn’t too impressed with them….but they aren’t entirely bad either. Perhaps on sale they might be worth picking up a shade or two. I wouldn’t write them completely off but I do prefer Hard Candy’s version in comparison however, Hard Candy sadly lacks pigment though! Extra Large Latte Magnified MauveAnyone try ’em? Love your blog! Great Reviews!! I saw these at my local CVS recently, but got the apple lip balm instead. aw thanks texas muse! 😀 the apple balm is awesome! how are you liking? I got the one called “Apple Blossom” and it’s simply delicious!! Not a whole lot of color, but lots of moisture for soft, soft lips. I bought two of these and returned them. They smell so bad! It was like a cross between baby powder and floral, yuck! I couldn’t quite get my head wrapped around the smell, it was like play doh with perfume or something!? once they are on it isn’t too too bad but yeah wasn’t impressed by the scent/flavor either amanda! I guess with cheap products, you have to take the good with the bad. 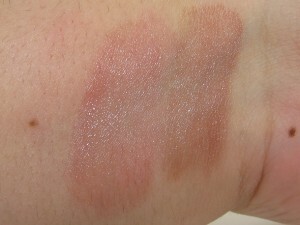 I would maybe like to pick one of these up being that the pigment is there, but its too bad it doesn’t go on as shiny. When I read you like the Hard Candy versions better, I thought cool maybe I’ll get one of those instead, but pigment lacking! Wow, thanks for the review. Your eyes look amazing in these pics, Muse!! Hi Muse! What eyeshadow are you wearing? Your eyes look stunning…such a pretty girl you are! my pleasure libby!!!!!!!!!!! <3! Happy to hear about Chanel's singles! I was actually going to indulge in two shades this past weekend but ended up skipping ;-D now I might need to head back! love it! muse ur makeup in both pics look really nice! aw thanks reen you’re lovely to say so!